View more events on our Facebook page! Grab your mom and celebrate Mother’s Day a little early in Downtown Ripon and surround area for Women on Watson on Saturday, May 12. 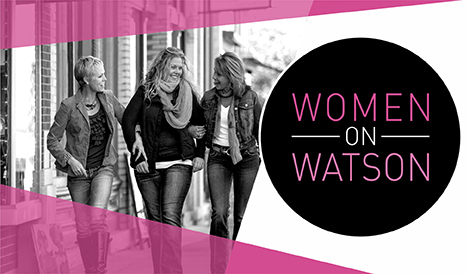 Women on Watson will begin with a fashion show held at Wisconsin Reclamation Project located at 110 Blackburn Street in downtown Ripon. The fashion show will include local shops: A Little Somethin' Somethin', The American Alchemy, Brinkley's Boutique, Dear Prudence, Hamilton's Ladies Apparel, Soiree and Violet & Company. Registration for the show will begin at 10:00 am. You will be treated with a buffet brunch and mimosa. The fashion show will begin at 10:30 am. Tickets for the event are $25 each in advance, or $30 after May 1. Seating is limited. Come on down and join us...it's going to be an exciting day! Discover historic downtown Ripon, Wisconsin, stroll through the unique array of local businesses, enjoy shopping and dining and make memories with your mom that will last a lifetime. 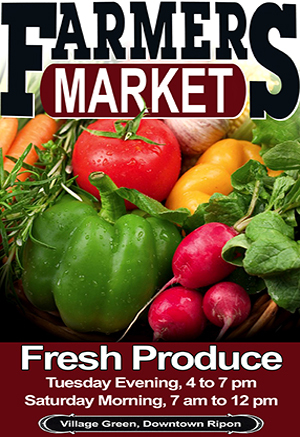 Every Tuesday evening and Saturday morning, vendors offer locally grown fresh produce at the Watson Street Farmers Market. People worldwide are rediscovering the benefits of buying local food. It's fresher than anything in the supermarket and that means it is tastier and more nutritious. It is also good for our local economy--buying directly from family farmers helps them stay in business. The market, which runs June through October, takes place at the Village Green located at the intersection of Watson and Seward Street in Downtown Ripon. The Watson Street Farm Market Regulations and other useful information can be downloaded by clicking one of the PDF links below. The Ripon Summer Concert Series encompasses a wide range of musical genres including country, blues, classic rock and other styles, and is free to the public. Concerts run from 7:00 to 10:00 pm and take place in Historic Downtown Ripon near the corner of Watson and Seward Street. Participants are encouraged to bring lawn chairs or blankets to sit on. A variety of beverages are available and participants are encouraged to bring lawn chairs or blankets to sit on. NO CARRY-INs are allowed in the park because beverage sales help cover entertainment expenses. Ripon Main Street, Inc. invites you to enjoy an evening of entertainment in historic downtown Ripon and discover what makes our community so special.Visit the Ripon Summer Concert Series website for additional information. 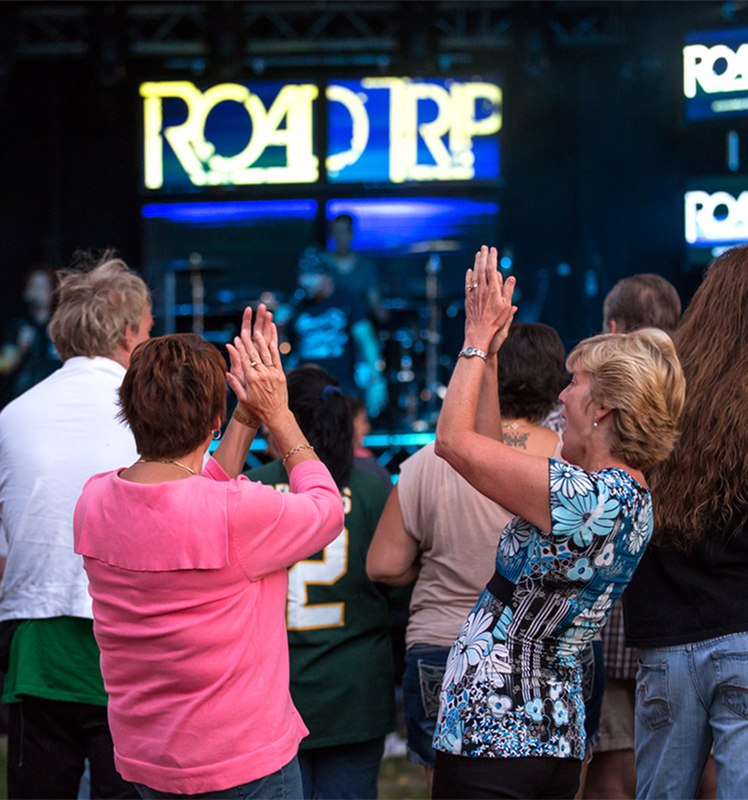 Ripon has added a bonus event to the popular Summer Concert Series. 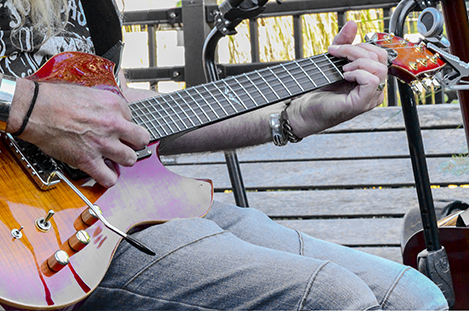 In addition to the popular weekly Friday night concert at the Village Green, music lovers also have the opportunity to take in an extra day of live music. The series has added the Ripon Jam to its lineup. MoJoe & Flipside returns to the series this Friday, July 13. Funky-Blues Americana best describes MJ's musical style. The MJ's, featuring former members of Otis and the Alligators as well as former Streetlife drummer Tony Wagner, take the best of the blues and combine elements of R&B and funk to form their own unique sound. Their repertoire includes music from artists ranging from Ray Charles and James Brown, to Santana and Bruno Mars. The MJ’s concert, which is sponsored by Ripon Family Dentistry, takes place from 7:00 to 10:00 pm. Bonus performances have been added to Saturday, July 14 with the Ripon Jam & Craft Beer Fest taking place throughout the day at the Ripon Village Green. The Ripon Jam features a diverse lineup of Blues, Funk and R&B performers. The music begins at noon with Dan Braaksma & Al Muenchow. The music continues throughout the day and into the evening, with performances by the Jay Edward Band at 2:00 pm, David Gerald at 5:00 pm, and Stephen Cooper and Nobody Famous taking the stage at 8:00 pm. NO CARRY-INs are allowed in the park because beverage sales help cover entertainment expenses. Retail deals returns to Ripon on Friday, August 3 & 4. 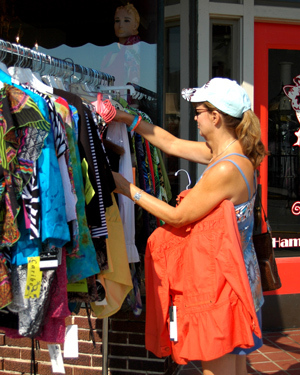 Participating businesses will set up outdoor tables in front of their stores piled high with merchandise that must go. Those strolling up and down the sidewalks will find unique gifts, clothing, jewelry, furniture and more. Numerous businesses are participating in the event with various discounts from store to store. Many participating retailers will extend their sale through Saturday remaining open until 4:00 pm or later. Enjoy a day encountering the unique shopping, dining and entertainment opportunities that are available in historic Ripon, Wisconsin, and discover the charm of small town hospitality. Visit www.downtownripon.com or www.ripon-wi.com for additional information. You'll have a splendid time at this unique fall festival. Cruise into Historic Downtown Ripon and check out the Watson Street Custom Car Show. Car collectors in 15 classes different classes showcase their vehicles, ranging from antique to late-model trucks. The Pet Parade is another must see event. Activities include contests for best costume, best pet trick, most unusual pet, and more. 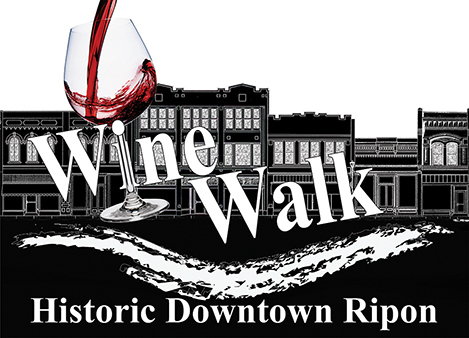 Visit historic downtown Ripon on Friday, November 2nd for our Holiday WineWalk. During the event, which takes place from 5:30 to 8:30 pm, businesses will become “tasting rooms” where attendees may sample up to 20 different wines throughout the evening. Each participant will receive a souvenir wine walk glass, and a wristband which is good for up to 20 wine tastes through the evening. A limited number of tickets are available at the Ripon Chamber/Main Street office located at 114 Scott Street in downtown Ripon. Advanced discounted tickets are $25 each per participant. The event will feature a selection of wines from Chile, Argentina, Italy, Spain, South Africa and Australia, as well as California, Florida and Wisconsin, including local favorite Vines & Rushes Winery. Proceeds will benefit the Dickens of a Christmas festival and beautification projects throughout downtown Ripon, Wisconsin. Tickets may be redeemed for glasses and wristbands beginning at 1:00 pm at Chamber/Main Street office (114 Scott Street) on the day of the event. Lanyards have 20 tear tabs, good for one 1 oz. wine sample each. No alcohol will be served before 5:00 pm. Wine glasses must be empty before leaving each stop. Reminder...open intoxicants are not allowed in public spaces, and carry-ins are not permitted. Numerous business will be open late to provide you with an adequate dose of shopping therapy. Shop, dine and unwind in historic downtown Ripon. Come on down and join us...it's going to be a beautiful evening! Discover historic downtown Ripon, Wisconsin, and make memories that will last a lifetime. Join us for a truly magical experience at Ripon's Christmas in the Village! The event is a favorite of local residents and visitors alike. It's like a scene right out of an old-time movie with downtown decorations, extended store hours, carolers and musical groups entertaining the crowd, free cider and cookies, and of course Santa Claus! Bring the entire family for this annual holiday celebration! Experience the Victorian era by strolling up and down the streets Ripon's downtown historic district. Carolers will stroll through the streets spreading holiday cheer. Santa will greet children at Ripon Drug, handing out cookies to all the good little girls and boys. Saturday kicks off with Breakfast with Santa, and the Holiday Tour of Homes. Living Windows is the highlight of the festival, which takes place from 5:30 to 7:30 pm on Saturday evening. Over 40 storefronts are decorated with characters depicting old time setting. Other weekend activities include the Enchanted Forest, Gingerbread House Contest, the Dickens of a Quilt Show, and more! For information on this festival, contact the Ripon Chamber of Commerce at 920-748-6764, which sponsors the event. Ice skating is a longstanding winter tradition, and one of the few things that can lure Riponites from our cozy homes. Whether you are a novice or pro, getting out for at least one skate per season is a must. Bring the kids, a date, or meet a group of friends down at the Village Green and make magical memories that will be cherish for years to come. While winter officially begins December 21st, please remember that Mother Nature decides when these outdoor activities can start. To prepare the rink for skating, volunteers need two to four weeks of below-freezing temperatures to adequately develop ice. 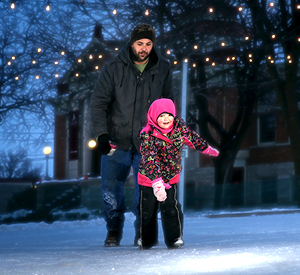 Keep up to date on outdoor ice skating conditions by joining our Facebook page at www.facebook.com/riponwisconsin. Ripon College offers a broad variety of performances (including the Milwaukee Symphony each fall), guest speakers and artists plus NCAA Division III athletic events (August through May). Visit the college's website for more information.